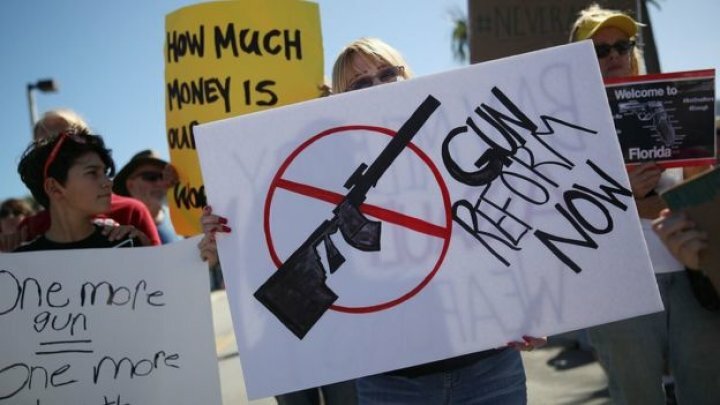 The US National Rifle Association (NRA) has said it does not support any gun ban following a shooting in a Florida school that left 17 people dead. The NRA's comments appear to go against President Donald Trump's proposals to tighten gun controls. Since the 14 February attack on the Marjory Stoneman Douglas High School the NRA has become a target of a campaign for tougher gun laws. On Sunday, some students returned to the school for the first time. Accompanied by their parents, they were back for what the authorities in Parkland described as "orientation". A variety of support services were available at the campus. Students are preparing to return full-time to their classrooms on Wednesday. Dana Loesch, a spokeswoman for the influential gun lobby group, told ABC News: "The NRA doesn't back any ban." She said the massacres like that in Florida were not caused by the NRA. Ms Loesch suggested there had been errors by local law enforcement agencies and a lack of action by politicians. Florida officials revealed after the shooting that an armed officer assigned to the school had stood outside the building during the shooting and not intervened. The NRA endorsed Mr Trump during his 2016 presidential election campaign.